James Casebere’s Yellow Hallway at Sean Kelly (NY). The large format digital C-print depicts a yellow hallway, its paint peeling, filled part way with water. A few artist’s work appeared in multiple booths such as gold painted assemblage sculptures by John Miller and paintings by Bernard Frize. Julian Opie’s work appeared twice, one of which was a walking figure and another was a multi-paneled scene of a lake with a landscape in the background. 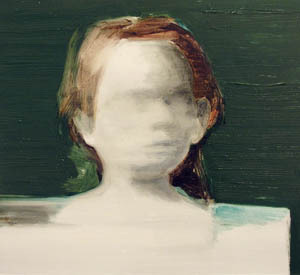 Paintings by Susanne Simonson at Galleri Magnus Karlsson (Stockholm) of little girl’s heads. This entry was posted in General on March 28, 2008 by Lauren Della Monica.